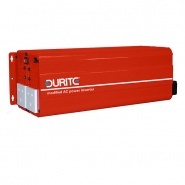 Durite 12V DC 140W mini can modified sine wave inverter. Protected against overload, over temperature, low battery and short circuit. 12V DC modified wave voltage inverter, input 10V-15V DC to 230V AC 50Hz output, rated 125W continuous. 12V DC modified wave voltage inverter, input 10V-15V DC to 230V AC 50Hz output, rated 250W continuous. 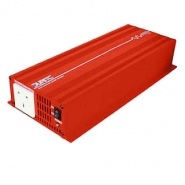 Voltage inverters with 240 volts and 110 volts ac output from Arc Components Ltd. Various load sine wave and modified wave 12V dc and 24V dc inverters in 125W, 250W, 500W, 1000W, 1500W, 2200W and 3000W versions including 110V output. 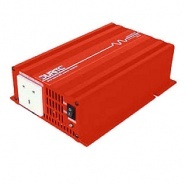 Power inverters to convert a 12V dc or 24V dc supply into a 240VAC or on selected models 110VAC output. Inverters allow the use of electrical equipment from simple media like radio's and LED/LCD TV's, to higher wattage requirement equipment like kettles, microwave ovens, fridges and trade power tools. 24V DC modified wave voltage inverter, input 20V-30V DC to 230V AC 50Hz output, rated 125W continuous. 24V DC modified wave voltage inverter, input 20V-30V DC to 230V AC 50Hz output, rated 250W continuous. 12V DC modified wave voltage inverter, input 10V-15V DC to 230V AC 50Hz output, rated 500W continuous. 24V DC modified wave voltage inverter, input 20V-30V DC to 230V AC 50Hz output, rated 500W continuous. 12V DC modified wave voltage inverter, input 10V-15V DC to 230V AC 50Hz output, rated 1000W continuous. 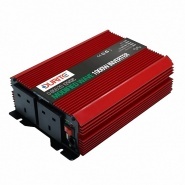 Durite's double socket inverter, modified wave 12 volts DC to 230 volts AC. 1000W, 230 Volts AC duel socket modified wave inverter. Modified wave voltage inverter, input 24V-28V DC to 230V AC 50Hz output, rated 1000W continuous. Double socket inverter, modified wave 24 volts DC to 230 volts AC inverter. 1000W, 230V AC duel socket modified wave inverter. 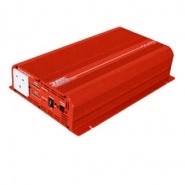 12V DC modified wave voltage inverter, input 10V-15V DC to 230V AC 50Hz output, rated 1500W continuous. Double socket inverter, modified wave 12 volts DC to 230 volts AC inverter. 1500W, 230 Volts AC Duel socket modified wave inverter. 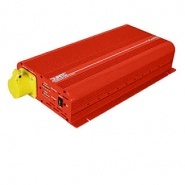 24V DC modified wave voltage inverter, input 20V-30V DC to 230V AC 50Hz output, rated 1500W continuous. 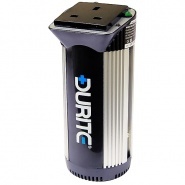 Durite's double socket inverter, modified wave 24 volts DC to 230 volts AC. 1500W, 230 Volts AC Duel socket modified wave inverter. 12V DC modified wave voltage inverter, input 12V (10V-15V DC) to 110V AC 50Hz output, rated 1500W continuous. 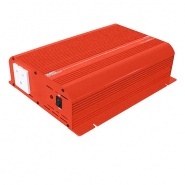 24V DC modified wave voltage inverter, input 24V (20V-30V DC) to 110V AC 50Hz output, rated 1500W continuous. Double socket inverter, modified wave 12 volts DC to 230 volts, 2000W, 230 Volts AC duel socket modified wave inverter. Modified wave voltage inverter, input 10V-15V DC to two 230V AC 50Hz outputs, rated at 2200W continuous. 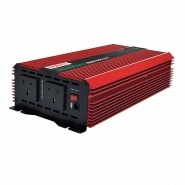 24V DC modified wave voltage inverter, input 24V DC to two 230V AC 50Hz outputs, rated 2200W continuous. 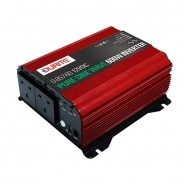 12V DC modified wave voltage inverter, input 10V-15V DC to two 230V AC 50Hz outputs, rated at 3000W continuous. 24V DC modified wave voltage inverter, input 20V-30V DC to two 230V AC 50Hz outputs, rated 3000W continuous. Remote control unit for modified wave voltage inverters part numbers 0-856-10, 0-856-60, 0-856-15, 0-856-65 only, with 5 metres of cable. 12V DC sine wave voltage inverter, input 10V-15V DC to 230V AC 50Hz output, rated at 125W continuous. 24V DC sine wave voltage inverter, input 20V-30V DC to 230V AC 50Hz output, rated at 125W continuous. 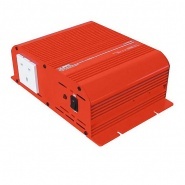 12V DC sine wave voltage inverter, input 10V-15V DC to 230V AC 50Hz output, rated at 250W continuous. 24V DC sine wave voltage inverter, input 20V-30V DC to 230V AC 50Hz output, rated at 250W continuous. 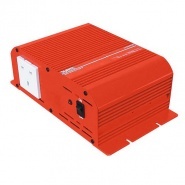 12V DC sine wave voltage inverter, input 10V-15V DC to 230V AC 50Hz output, rated at 500W continuous. 24V DC sine wave voltage inverter, input 20V-30V DC to 230V AC 50Hz output, rated at 500W continuous. 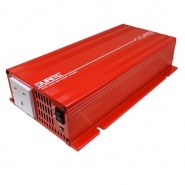 600W, 230 volts AC pure sine wave inverter with 2 UK 3 pin outputs. 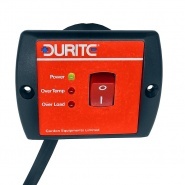 Input 11-15.5V DC to 230VAC 50Hz output. 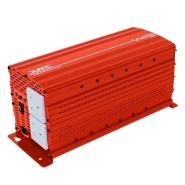 Rated 600W continuous.